Some watchmakers put amazing complications on their watches. These complications are even more astonishing considering how much engineering watchmakers are able to fit into a space of under 10 millimeters. Some of the parts that go into these science-defying watches are as thin as a hair. I imagine tiny people, the size of a fingernail, using microscopic tools building these watches. We know the names of many of these complications: GMT, jumping second hand, minute repeater, perpetual calendar, chronograph, power reserve, retrograde hands, day/night indicators, moonphase and others. 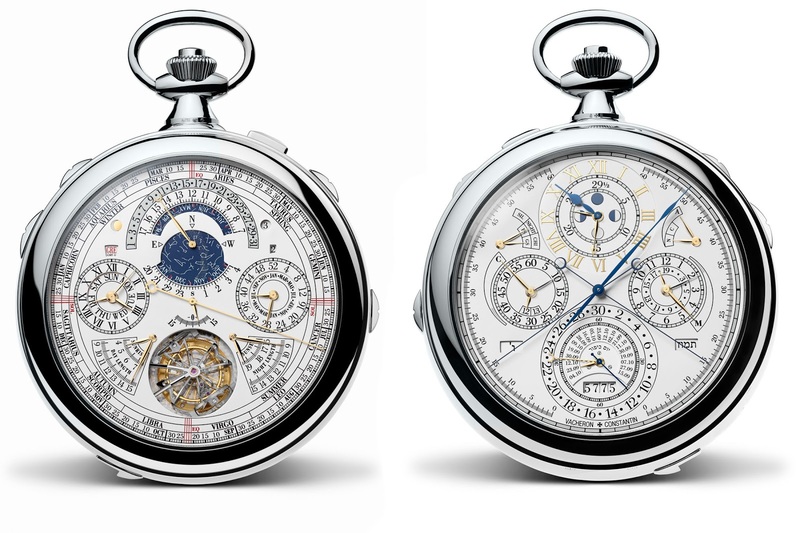 Other complications are more esoteric: Jaeger-LeCoultre’s Reverso with a zodiacal calendar, Greubel Forsey Invention GMT with its spinning globe, Patek Philippe Sky Moon Tourbillon with its starry sky display, Franck Muller Aeternitas Mega 4 with the astronomical moon and leap year indicator, for instance. The Franck Muller Aeternitas Mega 4, weighing in at $1.4 million, offers 36 complications. 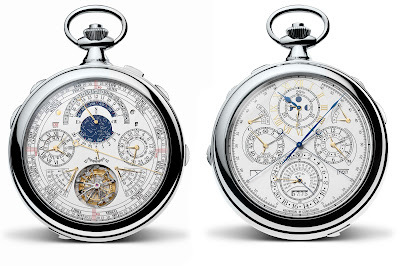 This year Vacheron Constantin released the Reference 57260 pocket watch, the most complicated watch ever made, with 57 functions. In one watch. Remember when the world was simpler and we all thought that Baskin Robbins’ original 31 flavors was a lot? boyfriend or girlfriend you’ve ever had. Photo from Vacheron Constantin. Cooking timer for different foods, such as chicken, beef, and fish, with weight information built in. Five-minute countdown timer because so many things are, "Just five more minutes." Countdown dial until Friday, 5 PM. All watches need this complication: With the twist of the crown or press of a pusher, the watch hands leap to 10 past 10 and stays there for thirty seconds, long enough to snap a pretty wristshot. After thirty seconds, the hands resume the correct time. Cat and dog feeding alarm (arguably superfluous, because cats and dogs will let you know when they’re hungry, but then again, most complications are unnecessary). A way to measure the speed of light. I'm just thinking ahead. Watch hands that freeze in place. Press a button and a second set of hands appears and freezes so you can forever record and remember what time something wonderful happened. This complication can be used only once. Pill-taking reminder alarm, settable in 24-, 12-, 6-, and 4-hour increments. Season starting chime that chimes four times a year at midnight on the day that the new season begins. Days remaining until April Fool's Day display (because for some people, this is the best holiday). Daylight Saving Time change chime. Total solar eclipse indicator that you can set for any place in the world. Red and blue circles that eclipse each other every 12.5 days for no particular reason. An 11-year solar cycle dial. Perpetual Umma calendar (from bronze-age Mesopotamia). Why not? Werewolf indicator: People become werewolves immediately before the night of a full moon, at a full moon, and the night after the full moon. Carbon-14 half-life dial that makes a complete revolution every 5,700 years.